This Autumn I entered the 'Fall Photo Contest' from Emily's Vintage Visions. Emily shared some wonderful fashion articles from 1940 and asked contestants to base a vintage look around the outfits detailed in the text. "Green took a curtain call in a brighter shade, this time worn in a two-piece suit, and worn with, of all things, a bright red sailor and bright red gloves." I didn't win a prize - the competition was fierce - but it's always fun dressing up for an impromptu photoshoot. Bag: Free with Max Factor makeup! I'm not too sure about the date of the suit, which was sold to me as 1930s, so please let me know if you have any thoughts on it. At first I wasn't convinced it could possibly be as old as the 1930s, but on referencing my "1930s Fashion: The Definitive Sourcebook" there are lots of key details which mirror those from the early 1930s, such as the type of button, the neck tie, and the zig zag assymetric closure to the front of the jacket. 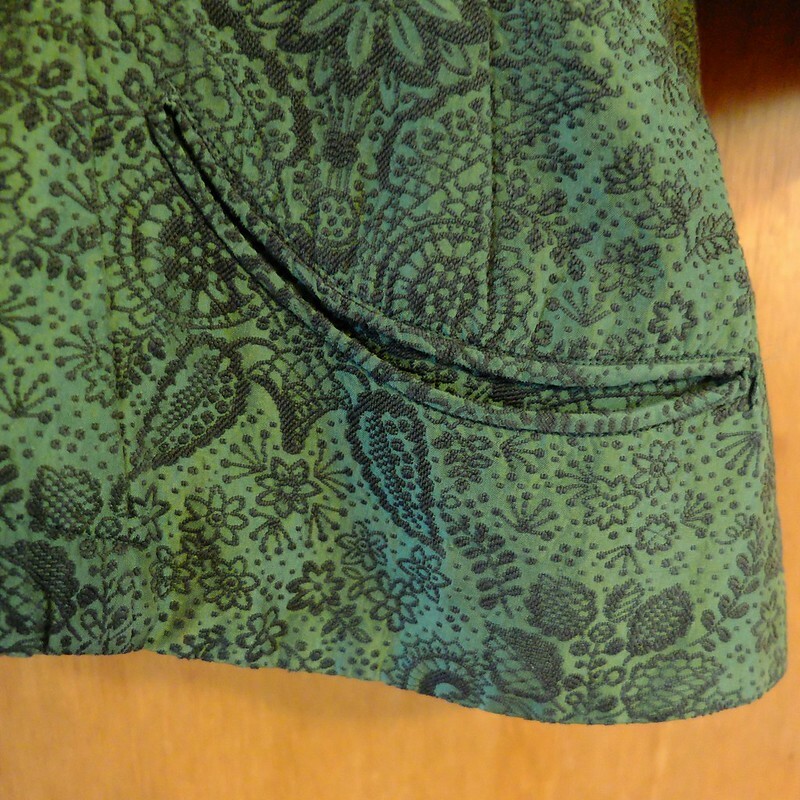 The skirt is knee-length on me, which is a bit short for that era, but I realise it could have been made for a much shorter woman than me. 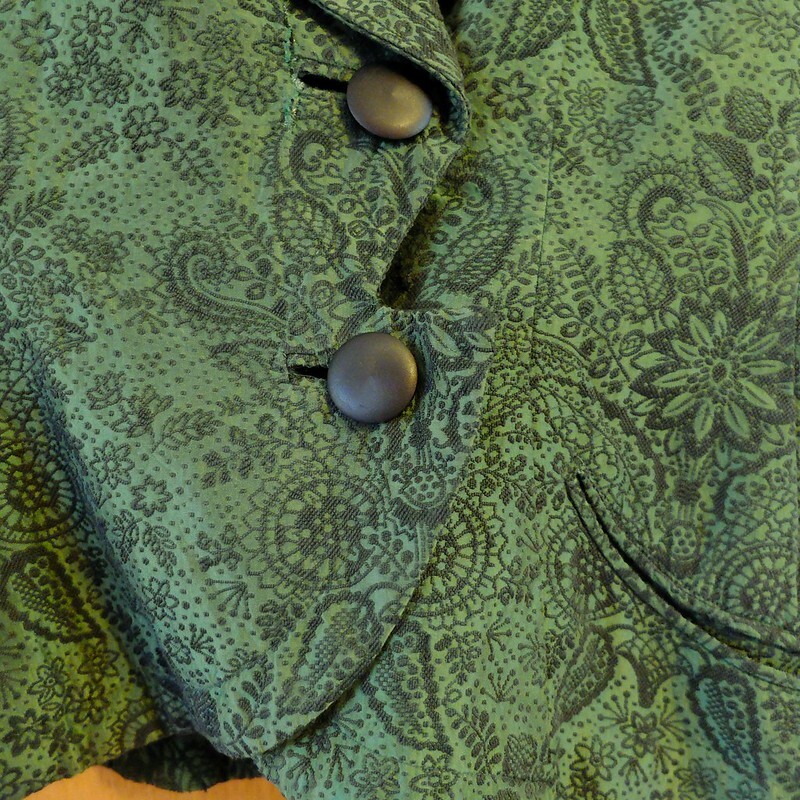 Have a look at my close-ups of the jacket below and see what you think. 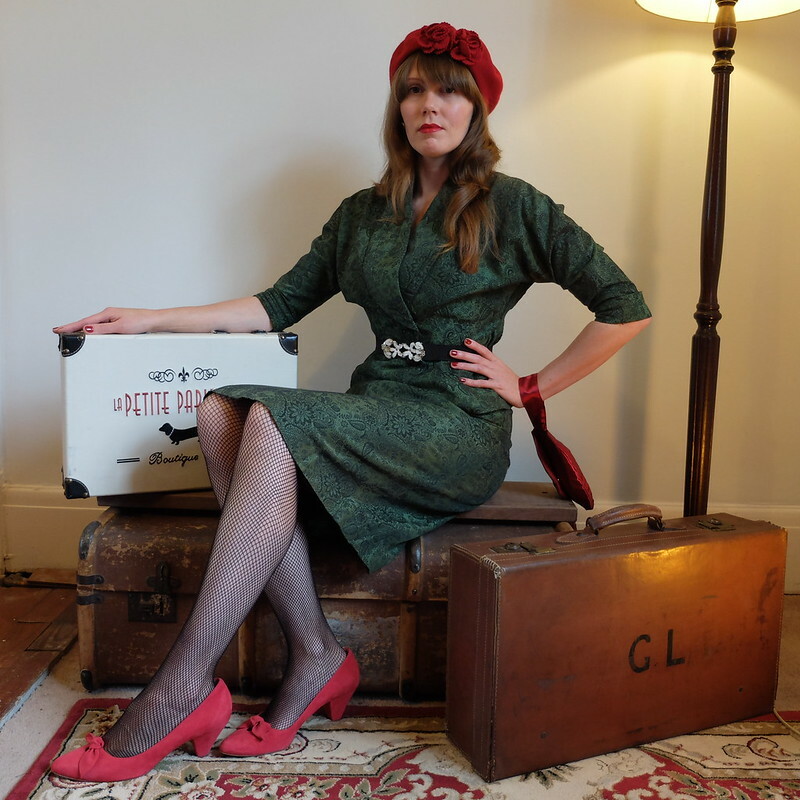 When I first started to get into vintage I was heavily into the 1930s, but quickly realised that my pockets were not able to match my tastes in terms of purchasing original 1930s clothing. After a few projects, including the Downtown Abbey dress, I wanted to buy vintage clothing that didn't need any major work doing to it, so started looking at 1940s and 1950s styles, and found much more of these eras' styles available in both vintage reproduction and on the high street. It's so easy to find a '40s style tea dress or a '60s style wiggle dress within a reasonable budget. There are some vintage repro brands such as House of Foxy which do carry a 1930's inspired line but again there's a bit of a hike in price. If any of you can assist me in dating the suit I would be ever so grateful! It's really hard to tell what era that suit is from, it could even be late 40s as some of the details are very much of that period too, but who cares, it's stunning and it looks amazing on you! I have a 1930s dress that could easily be mistaken as late 1950s without really looking into the detailing of it but I know it's 1930s and I love it. Super shot!!! I love that hat with the pop of red lipstick and nails, there's good reason it's a classic! That's a beautiful suit and it looks great on you. The details are very 30s and so neat. Maybe you could find someone to make you some 30s dresses from vintage patterns. You look fabulous! I love that suit - the color, the pattern, all the pretty little details. And it makes your waist look absolutely tiny, so that's always a plus. I haven't checked out the entries for the contest yet, but I really should take a look. There's always so much inspiration to mine in something like that. I hear you about your budget dictating the eras you can shop. I love 20s and 30s style, but finding wearable clothing from that era that I can afford is practically impossible. I feel like my best finds for those eras tend to be modern pieces from high street stores that I just stumble across. Wow! What a fabulous suit and photos! Such a unique piece. I can see why you're drawn to it. I bet you can wear the items separately too. I am not much help for dating the suit I'm afraid. Did you ask Vix? Her and Curtise are rather good at that. Regardless of who won, you're looking beautiful Porcelina - the entire setting is perfect. You woz robbed, you look fantastic. Love the combination of red and green. That suit is stunning and I just loved how you styled your submission. My "blink" feeling in terms of dating this post is much like Emily's. It does have some clear 30s styling elements, but ultimately strikes me as a more 50s/60s piece. 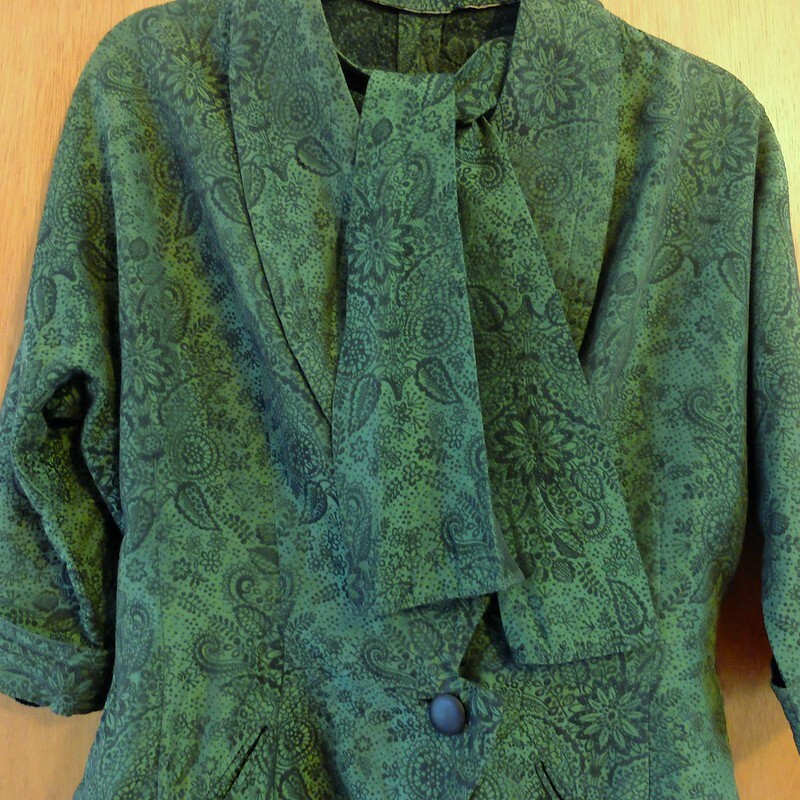 There's always the possibility, too, that it was an older garment that someone refashioned (perhaps a hand-me-down from a mom or older sister) into a more modern (at the time) suit later on. I have no idea about the date of the suit, but it is very attractive. 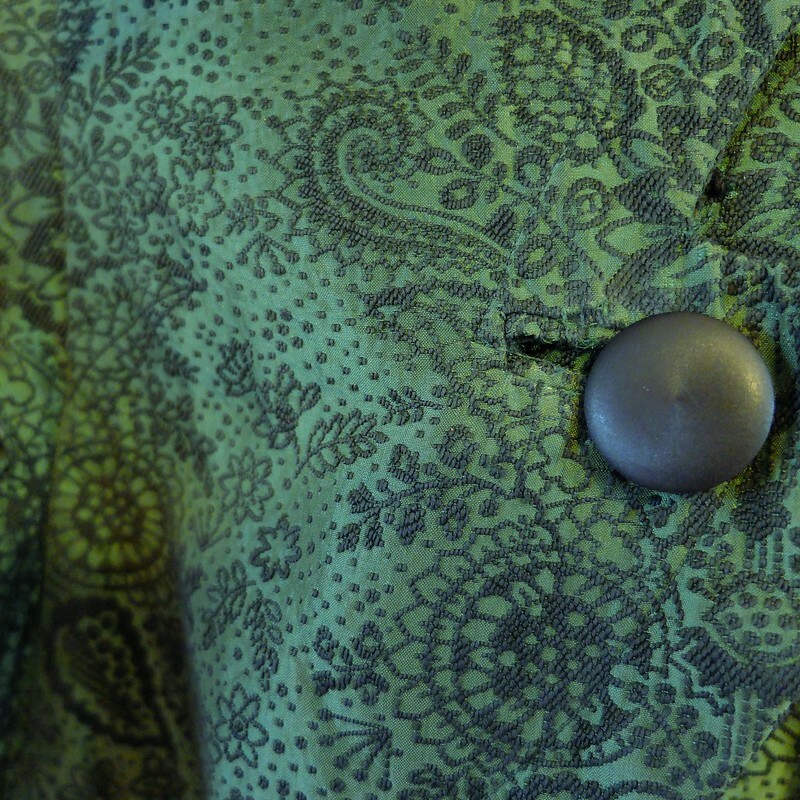 I love the details - very few firms seem to make nice suits any more. I look forward to seeing your home all done up for Christmas. Come join my Countdown to Christmas blog hop! Your blog is incredible and your ensemble sublime. No matter the era, the vintage suit looks fabulous on you. Thank you for sharing your gorgeous red beret and your beauty with Hat Attack! I'm really into 1930s style as well and you're right that it's hard to find, even in new, retro-style clothes. 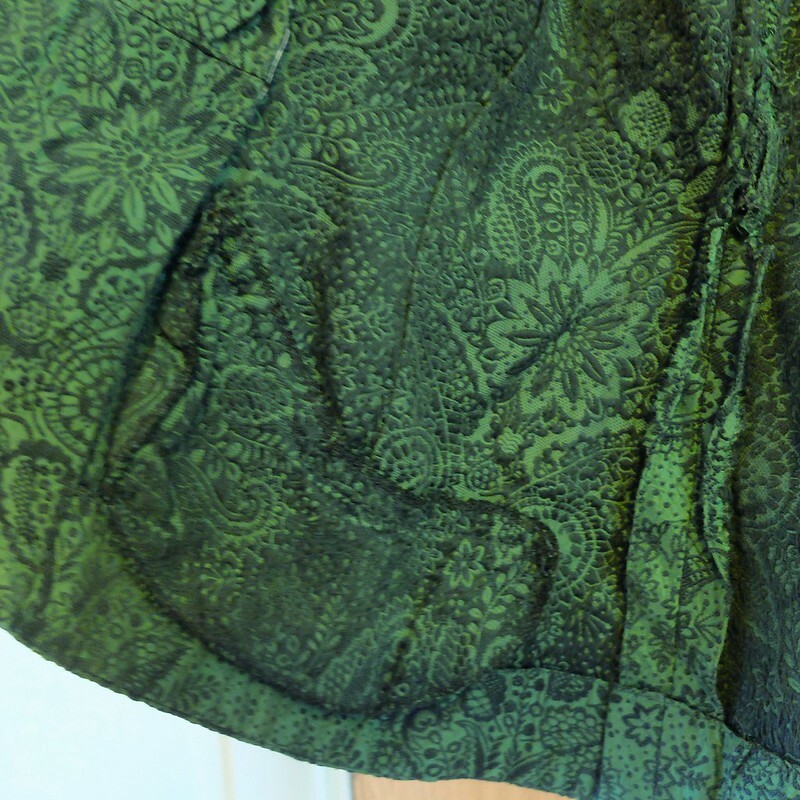 I just have to get really creative, mostly, but I do sometimes find perfect pieces in the most unexpected places. I found a great, brand new but 30s style dress at Sears the other day! It was even on sale for about $25. It will feature in an upcoming post. As for your outfit here, I'm not sure of the period either but the fabric suggests it might be 50s? Just a guess.